Ty Mayfield reviewed Picnic in a Minefield for War on the Rocks. Recchia is an Italian academic who left Europe for a position at the University of Kurdistan Hawler (UKH) in Erbil, Iraq in the hopes of expanding her professional horizons as an educator. In the course of two years, Recchia experiences life in many different circles. She transitions between guest, traveler, teacher, and mentor with an ease that disarms those who might stand in her way. It is from the unique perspectives of both her professional work at the UKH and her personal interactions with locals that Kurdistan is made real for the reader. 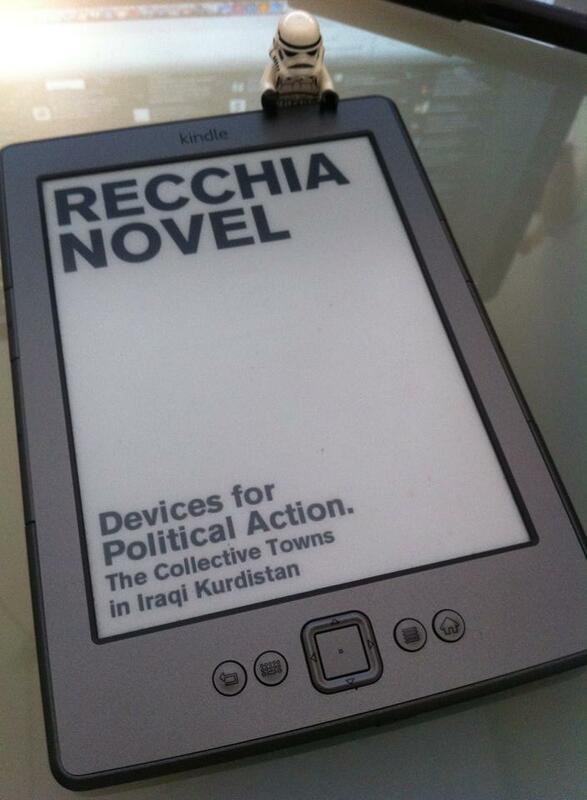 Through Recchia’s travels, the soldiers, diplomats, journalists and humanitarian aid workers that usually narrate our collective Iraq experience, are illuminated for the reader from a new perspective. She reports their actions, thoughts and intentions in the insightful and articulate observations of a self-aware and humble narrator. Recchia set out for Iraqi Kurdistan in search of herself. Along the way it is fair to say she found an entire group of people in search of themselves, their own identities, and perhaps, their own nation. These two arcs, one individual and one collective, intersect in Picnic in a Minefield and provide a compelling narrative that gives insight into the permanence of resistance, the pace of change, and the promise of a Kurdistan. This article was initially published in Domus 958 in May 2012. The Autonomous Region of Kurdistan has in recent years been in the news as the “Other Iraq”. In 2011, National Geographic described it as an oasis of peace and development, and The New York Times placed it 34th out of 41 best travel destinations— beating Miami, which finished up in last place. In reality, the region is not so much a tourist attraction as it is land prized by multinational and private investors. After Saddam Hussein’s bloody ethnic persecution, a decade of armed conflict between Iraq and Iran, two wars to export democracy, and one civil war, Iraqi Kurdistan today is striding towards a new state of political and economic stability. Its long history of war and violence has left indelible marks and scars. At the same time, however, it has created a unique situation characterised by openness and opportunity. The future is all there to be invented, there is plenty of scope for experimentation, and the direction to be followed can still be chosen. 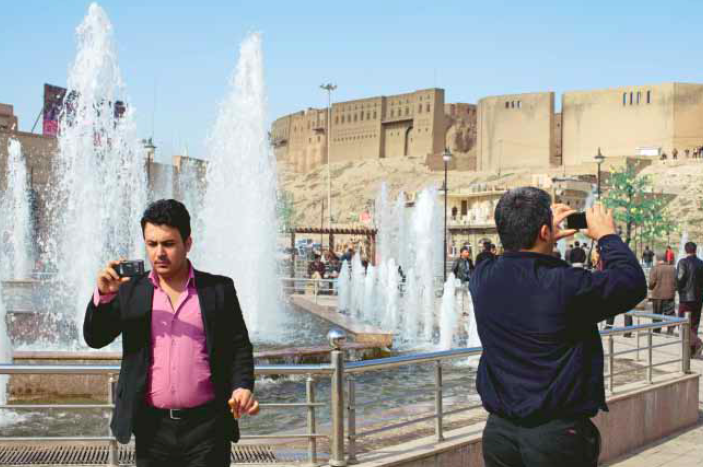 Erbil, the regional government capital and one of the world’s most ancient cities, inhabited without interruption for thousands of years, is an extraordinary example of that condition. One of the principal artifices of this growth is Nawzad Hadi, governor of Erbil since 2004. In a recent interview, with the clarity of a visionary he illustrated to me the steps required to fulfil what he calls a great dream: the building of a city worthy of being an international capital, “a new Dubai”. That is no mean statement, considering that Kurdistan is not even an officially recognised state. “I am doing it for my people, who deserve it after years of oppression.” The magnitude of Nawzad Hadi’s challenge is quite incredible. It began with the asphalting of roads and the guarantee of standard access to water and electricity, continued with the completion and implementation of a master plan and the prospect of a green belt around the city, and is now on its way to transforming Erbil into an economic and commercial hub. In an explosive mixture of individual profit and common good, the governor has embraced the city’s historic and cultural profile as the symbol of this rebirth. He has started a restoration of the Citadel, Erbil’s ancient heart, by working with UNESCO to have it included in the list of World Heritage Sites. At the same time, with an eye to the international trends of the architecture star system, he appointed Daniel Libeskind to design a museum of Kurdish memory, an audio-visual project for the historical and narrative reconstruction of the Kurdish genocide. Work on the museum is scheduled to commence this year. The Autonomous Region of Kurdistan chose Erbil as the emblematic image of its capacity for self-government, and in this case investment in its urban growth has been notably political. Through the concession of land-tax benefits and structural support, the regional government is encouraging the circulation of private capital. This has made a significant impact on the city’s development and building prospects. In the past five years the world’s biggest corporations have staked claims in the city, luxury hotels have multiplied, and new residential complexes have sprung up suggesting the possibility of exclusive lifestyles and their desirability. Dream City, Empire City, English Village, Royal City, Vital City and Italian Village are gated communities now occupying a large slice of Erbil’s outer ring road, not far from the construction site of the Marriot Hotel and from the 23-storey Hotel Divan tower. Erbil’s economic prosperity is just one of the multiple sides of this transition to a mature state of democracy. Traces of years of conflict—and the fact that virtually all investment has been confined to the growth of this capital city—are on the other hand dramatically evident in the rest of the region. Contrasting the enthusiasm of this new prosperity are the mountain villages and refugee camps where resilience and the art of making ends meet are means of ensuring survival. Wlaxlw is a village of about 50 mud-and-stone houses, on the border between Iraq and Iran. Its geographical position made it a constant target of bombardment during the war between the two countries. To this day it is surrounded by the aftermath of that conflict in the shape of missiles, bullets and bombshells, ammunition boxes and helmets. Over the past 20 years the inhabitants of Wlaxlw have made a virtue of necessity, by utilising the debris and rubble as building material for their postwar reconstruction. Thus Katyusha rockets have become support beams for ceilings or pillars for pergolas, missile casings are converted into drainpipes, and helmets (those without bullet holes at forehead level) are used as flowerpots or to collect rainwater, while landmine warning signs serve as firewood props, and ammunition boxes sunk into the ground provide steps to the higher part of the village. Wlaxlw is a cross-section of an amazing world, a bizarre combination of a post-apocalyptic landscape and an oil painting by an 18th-century orientalist. But it is not the only example of the contradictoriness of these coexistences. Stories of this kind are illustrated by the various army buildings once occupied by Saddam Hussein’s troops stationed in Kurdistan. From the end of 1996, at the height of the civil war, these structures began to be converted into “villages”, complete with mosques, small shops and elementary schools. Ma’asker Salam, Top Khane and Raparin are three such villages, located a few kilometres from Sulaymaniyah, the second largest city in the Automous Region of Kurdistan. Ma’asker Salam is where Saddam’s army stables were situated. Today, some 300 families have found accommodation there. Not far away is Top Khane, a group of 12 buildings formerly used as an arms depot and now occupied by another 300 families. Raparin, located closer to the city centre, was in Sadam’s day a large industrial complex used to produce and repair weapons. Today it hosts a maze of self-built huts, inhabited by some 70 families. By a curious twist of fate, what were once the building-symbols of the Ba’athist regime’s military oppression have been transformed into a safe haven for hundreds of families, the place of refuge they call home, while waiting (with ever diminishing faith) for the politicians to keep their promises of compensation and assignment of public housing. During this long wait of more than 15 years, the old army buildings have changed their appearance as a result of spontaneous actions by inhabitants. Using improvised materials and traditional construction techniques, they have gradually turned this political aberration into something more like a familiar and hospitable landscape. Haji Mahmoud and Nadja, two residents of Ma’asker Salam, recount that local and international NGOs helped refugees to settle into the abandoned military structures. At Ma’asker Salam, the stables were initially divided by makeshift walls into rooms to accommodate one or more families each. In the course of time and with a growing awareness that the situation would take years and not months to be resolved, the inhabitants of these permanently temporary villages began to expand. They partitioned the rooms assigned to them in order to meet the needs of their families and to create more comfortable living conditions. Nadja lives in a corner house and changes the colour of its interior three times a year. With her husband she has laid out a garden, its flowerbeds bordered with stones and broken bricks. There are also three trees, grown from the kernels of fruit and each planted to mark the birth of her three daughters. “All I’d like is a nice house,” she says, “nothing more”. With snow-capped mountains on the horizon, the landscape of Ma’asker Salam and Top Khane has a surreal look. The picturesque impression of mountain villages clashes with memories of a cruel and dramatic past which the inhabitants have not yet managed to cast off. The old stable buildings at Ma’asker Salam are today barely visible. Covered with satellite dishes, they are now a mass of irregular dwellings built from cement blocks, stone and rough earth bricks, and wrapped in coloured striped plastic sheets for winter insulation. In a surprising combination of improvisation, recycling and vernacular architecture, remnants of plastic and metal mark out Haji Mahmoud’s garden, where birds are kept off by scarecrows made of snipped plastic bags. In the courtyard next door, his son and daughter-in-law have built a pergola with the wooden poles of building sites, while their neighbour has used the door of a derelict car as the gate to a courtyard surrounded by a dry wall. Between the sushi bar on the 21st floor of a 5-star hotel in downtown Erbil and the Katyusha rockets used as construction material in Wlaxlw, observing the anthropised landscape can be an outstanding means of interpreting what is often, abstractly, defined as a postwar dimension. The iniquitous distribution of wealth derived from the postwar reconstruction efforts has left indisputable signs of the temporality of a twisting and frequently obstacle-strewn path. In Iraqi Kurdistan, improvisation and resilience are the other side of the coin to massive urban development and the dream of becoming the next Dubai. Torn between far-sightedness, forgetfulness and selective memory, territory is revealed as neither a neutral nor an innocent platform, on which political debate and intervention are staged and the future takes shape. L’autunno a Kabul è una stagione preziosa. Mentre scrivo, vedo nel giardino le ultime rose: quelle ancora fiorite sono rosa e rosse; i tre alberi di mele cotogne carichi di frutti che stanno pian piano maturando; la pergola con i pochi grappoli d’uva che hanno resistito alla grandinata dell’altro giorno; e le macchie rosso sangue dei frutti del melograno, piccoli quest’anno, ma pieni di succo. La percezione del cambiamento è quotidiana, annunciata in modo teatrale da mezzora di grandine. Chissà perché solo una all’anno, la terza da quando sono qui, veloce e violenta segna il passaggio da una stagione all’altra. La temperatura si abbassa, le giornate si accorciano, mi ostino a dormire ancora con la finestra aperta e ad uscire senza calzini – anche perché mi sono dimenticata le scarpe in Italia, ma questa è un’altra storia. Con l’autunno arrivano anche le tempeste di sabbia, che qui hanno anche un nome tutto loro, khaakbaad, che letteralmente significa vento di polvere. Anche queste improvvise e passeggere – coprono tutto di una coltre marroncina, una tosse, uno starnuto e vanno via. Poi tornano, ma il passaggio è sempre breve e mai annunciato. Mi domando perché finisco sempre per andare a vivere in paesi in cui le tempeste di sabbia sono una parte integrante del paesaggio e della conversazione. Sono passati esattamente sei anni dal primo bollettino che ho spedito, era il 14 ottobre del 2008, e allora come adesso scrivo di tempeste di sabbia. Buffo. Montagne, deserto e tempeste di sabbia: strani elementi ricorrenti che danno forma e colore a tutti questi anni di viaggi, simboli inaspettati delle mie nomadi geografie dell’affetto. Autumn in Kabul feels very special. As I write I see in the garden the last blooming roses, the ones that are left are red and pink. The three quince trees are full of ripening fruits; the grapes that survived the hailstorm are waiting to be picked; and the blood-red pomegranates, which are smaller this year, are full of juice. In this time of the year you can feel the changes day after day. The season begins quite theatrically announced by a hailstorm that lasts just about half an hour. I wonder why hailstorms only happen once a year – it is the third since I arrived, they are quick and violent and they visibly mark the passage between the seasons. Autumn brings with dust storms, which here have their own name: khaakbaad that literally means wind of dust. Even these storms are sudden and transient – they cover everything in a brownish coat, trigger a cough, a sneeze and then go. But they come back, once again sudden, and always unannounced. I wonder why I always end up living in places where dust storms are an integral part of the landscape and the conversation. It is exactly six years since I sent out my first bulletin, it was the 14th of October 2008, then like now I wrote about sand storms. Funny. Mountains, deserts and dust storms: strange recurring elements that give shape and colour to all these years of travels, unexpected symbols of my nomadic geographies of affection. Tempo fa, Malavika Velayanikal ha scritto di me per l’Enciclopedia delle Donne. Molto è cambiato, il viaggio si è allungato, ma parte della storia resta. Francesca Recchia ha attraversato mezzo mondo, spinta dalla passione per la conoscenza. Forzando sia letteralmente che figurativamente molti confini, i suoi vagabondaggi l’hanno portata in posti insoliti e spesso pericolosi. Francesca ha sempre infranto convenzioni e stereotipi – come quando, da adolescente, è stata la prima rappresentante d’istituto di sinistra, interrompendo la lunga tradizione politica di destra del liceo di Avezzano, in centro Italia; oppure quando, molti anni più tardi, ha fatto conoscere agli studenti della University of Kurdistan Hawler, in nord Iraq, le potenzialità del pensiero critico e di forme alternative di dialogo. Lascia il suo paese d’origine subito dopo gli anni “molto” politici del liceo. Non è stata solo la scelta di laurearsi in Conservazione dei Beni Culturali a spingerla a Venezia, dalla parte opposta dell’Italia; trasferirsi a Venezia è stato perciò per lei un modo di ricominciare da zero: «dove nessuno mi conosceva e io potevo davvero capire chi fossi e che cosa volessi». Questa è per lei una costante: «Mi sento sempre un po’ fuori posto, cerco continuamente cose diverse e finisco sempre per essere un po’ più fuori posto, ma un po’ più contenta di prima». In ambito accademico la sua irrequietezza ha acquisito nel tempo significati diversi: non è mai stata capace di dedicarsi ad una sola disciplina, di studiare con un solo professore o in una sola università – «intellettualmente non sono monogama», dice. Nei primi anni di università hanno cominciato a prendere forma le sue convinzioni intellettuali: l’idea che la conoscenza non sia unidirezionale e che l’intelligenza sia un prodotto collettivo, ha giocato nel tempo un ruolo importante. Un’idea potente che, in realtà, non molti accademici condividono. Per la tesi di laurea (1999) ha mescolato arte e sociologia, scrivendo sull’arte contemporanea e i suoi devianti: l’esplorazione della linea sottile fra il genio e la follia non ha raccolto il consenso di tutti i professori. La sua relatrice, Giuliana Chiaretti, è stata la sola a sostenerla e ad incoraggiare il suo approccio interdisciplinare. Il Master in Studi Visivi al Goldsmiths College di Londra le ha cambiato la vita grazie all’incontro con Sarat Maharaj, un professore sudafricano di origini indiane. Qui, ancora una volta, ha rotto gli schemi organizzando un gruppo di discussione alternativo aperto a tutti, in cui artisti e critici potevano incontrarsi, cosa fino a quel momento piuttosto rara. Francesca, in questa fase del suo percorso intellettuale, ha cominciato a mettere in discussione le dinamiche di produzione della conoscenza ed è così che gli Studi Postcoloniali e Subalterni hanno colpito la sua attenzione. Quando Londra sembrava praticamente perfetta per lei, ha deciso di spostarsi di nuovo: l’Italia era nel bel mezzo della “fuga dei cervelli” e tornare le è sembrato un dovere morale. Con una borsa di studio consegue il dottorato di ricerca in Letterature, Culture e Storie dei Paesi Anglofoni presso l’Università L’Orientale di Napoli. Dopo le ondate di migrazioni successive alla seconda guerra mondiale, l’idea di Europa è cambiata e il “noi” e gli “altri” hanno preso all’interno dei suoi confini una nuova forma. Francesca ha subito il fascino della trasformazione di questa idea di alterità e ha deciso di scriverne per la sua tesi, utilizzando la città di Londra come caso studio. Infrangere i muri dell’arroganza intellettuale non rende la vita semplice a nessuno, e così è stato anche per lei. Con i suoi professori di Napoli ha sempre avuto difficoltà ma “fortunatamente” Sarat Maharaj è tornato nella sua vita, invitandola a lavorare per Documenta 11, la prestigiosa mostra che segna ogni cinque anni i paradigmi dell’arte contemporanea. Da lì ha cominciato a lavorare con multiplicity, un gruppo interdisciplinare di ricerca con cui ha condiviso, dice: «l’interesse per come cambiano le città e per il modo in cui le persone e i luoghi interagiscono». A Documenta, il gruppo di cui faceva parte aveva un mantra – Sbatti contro il muro e impara ad abbracciare il tuo destino – questo è stato da allora un motto che ha continuato ad accompagnarla visto che l’unico modo in cui riesce ad imparare è sempre per la strada più difficile. Ha viaggiato con diversi gruppi di ricercatori trovando opportunità per fare lezioni, studiare ed esplorare posti quali il Pakistan, la Palestina, il Kashmir, l’Oman, la Tunisia oltre a diversi paesi europei, sempre esercitando la sua non comune abilità di interpretare patterns insoliti, di unire punti di disegni invisibili. «Mi ha insegnato l’umiltà intellettuale e la consapevolezza che la curiosità non ha mai fine!», dice di lei Sir Peter Hall, uno dei padri fondatori dell’urbanistica europea. Con lui Francesca ha completato il post-dottorato alla Bartlett School of Planning della University College of London. Grazie alla collaborazione nel 2008 con TU Delft, in Olanda, con il gruppo Urban Body – che si interessa di sviluppo urbano mettendo al centro della prospettiva di ricerca il corpo umano – Francesca Recchia è arrivata a Bombay, in India, dopo analoghe esperienze a Pechino e Madrid. «Credo che l’intelligenza e la conoscenza siano processi condivisi, le mie lezioni non sono quasi mai frontali, ma fondate sulla discussione». Lezioni e conferenze nel tempo l’hanno portata a Venezia, Milano, Delft, in India, in Pakistan, in Palestina… Francesca ha sempre pensato all’insegnamento come ad un’attività politica – un’azione politica intesa nel senso della possibilità di produrre cambiamento anche se fino a quel momento la sua esperienza sembrava mettere in discussione le sue idee: «Ero a disagio, mi sembrava di essere pagata per prestare un servizio.» Per lei, insegnare l’importanza del pensiero critico, del dialogo, della discussione, dell’apprendimento democratico è sempre stato tanto rilevante quanto trasmettere i contenuti. Il Kurdistan iracheno è in una fase di transizione verso la democrazia e la missione della University of Kurdistan Hawler è quella di combinare tradizioni locali e pensiero contemporaneo: cercavano un docente di sociologia urbana e a Francesca Recchia questa è sembrata una occasione perfetta: l’esperienza di quei due anni sta diventando un libro che testimonia la ricchezza di quell’incontro. Francesca è tornata in India a luglio del 2010 dove ha lavorato per un periodo alla trasformazione radicale di un villaggio rurale prima di rimettersi di nuovo in viaggio. Il mondo è lì che chiama e lei è sempre pronta a rispondere. In 2014 Western efforts at engaging the Middle East—diplomacy, occupation, sanctions, bribery, adjusted trade policy, ill-considered cultural engagement and, worst of all, war, collapsed in the ruins of Syria and Iraq. Ignorance of the locale’s complex braid of culture, peoples, language, and faith among leaders and populations in the English-speaking world compounded the failed attempts at influence. Just in time, intrepid traveler, teacher, scholar, and journalist Francesca Recchia brings hope for enlightenment, nuanced discussion, and moral clarity with her stunning new memoir, Picnic in a Minefield. The book details her experiences living, working, and traveling among the Kurds of northern Iraq. This timely book offers a first-hand account of life, living, and lives-lived in area of the globe that perpetually dominates the West’s concerns and discourse. Recchia’s unique style and points-of-view illuminate Kurdish culture and the place of Kurds, who have long yearned for self-determination, amidst a cohort of nations intent on denying the mountainous Kurdish homeland its sovereignty. Recchia recounts how living in the region affected more than her understanding of, and opinions on, Kurdish culture. Through crisp prose and unforgettable anecdote, she shares with us the gift she received in Kurdistan: the company of the Kurdish people, liberated from an abstract prison of newsprint, brought to life in the minds and hearts of readers. 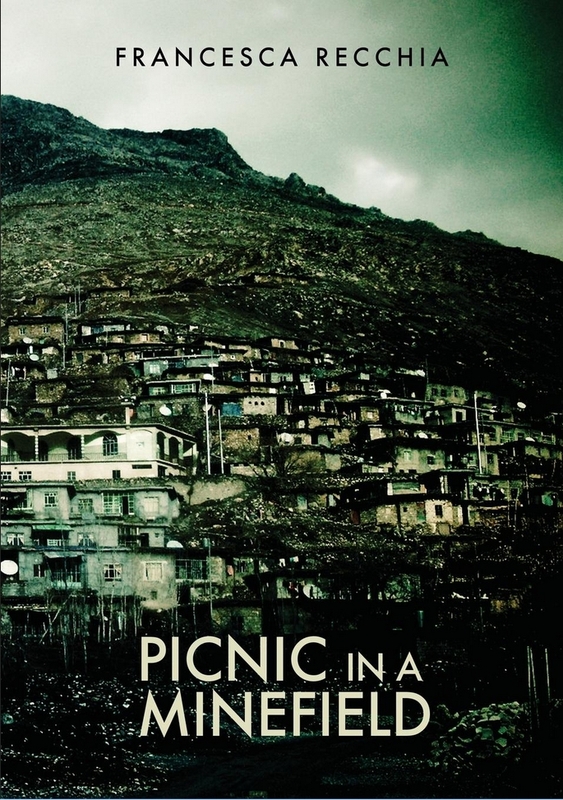 Picnic in a Minefield, by Francesca Recchia, is published by Foxhead Books. The book is on sale now at bookstores, online retailers, and at Foxhead Books. Foxhead Books publishes trade, electronic-books, and fine books. Foxhead Books is an independent book publisher and a division of Potemkin Media Omnibus, Ltd., an Ohio Limited Liability Company. My new e-book with a brilliant photo-essay by Leo Novel is finally out! Devices for Political Action. The Collective Towns in Iraqi Kurdistan looks at the case of Collective Towns in Iraqi Kurdistan as an example of how State interventions on the ground are often instruments utilised to implement broader political plans. Throughout the 1970s and the 1980s the Iraqi government made full use of spatial planning as a constitutive part of the strategy of “dealing with the Kurdish problem”. The Ba’ath regime adopted urban planning and space design as social engineering devices in its larger scheme of shaping society into a more homogenous and simplified form. The Iraqi government used the combination of ethnopolitics and a centralised ideology of modernisation to heavily intervene in the management and design of territory, causing a systematic disruption of local knowledge and practices. The book is part of dpr-barcelona’s Emancipatory Space Series and can be purchased here.